A unique way to sell hot dogs. This Gold Medal Table Top Steamer holds 40 hot dogs and 35 bunes. 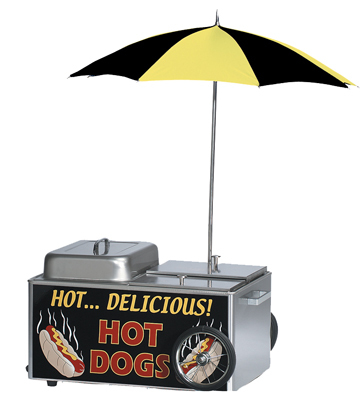 Stainless steel hot dog steamer includes a low water indicator light and easy-to-use drain valve. Look like a true Hot Dog vendor. This steamer is a real merchandiser. It's constructed of durable stainless steel. Electric heating element heats the water compartment. Two compartments for hot dogs, one is on "warm up" and the other is ready to serve. One large compartment for buns. The wheels are for decoration.